KayKiSpeaks.com: Smile: Cutest Kid Costumes! Lil Wayne, Diggy, & Nicki! Smile: Cutest Kid Costumes! Lil Wayne, Diggy, & Nicki! This picture made its twitter rounds last night after it was tweeted by Robert Ector! Its his nephew as Lil Wayne & a little lady as Nicki Minaj.. soo cute! 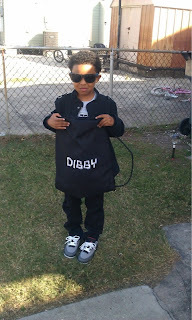 & not sure who's little man this is, but tell me he doesnt look like Diggy!!!!! I hope all of the kiddies & adults stay safe tonight!